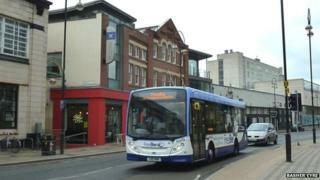 A free bus service around Sheffield city centre has been axed. The FreeBee bus, which makes frequent stops around the centre, has been scrapped because of financial cutbacks. South Yorkshire Passenger Transport Executive (SYPTE), which supervises South Yorkshire's public transport services, started the service in 2007 in an attempt to relieve congestion. The withdrawal of the FreeBee was part of plans to save £8m from the budget in 2014-15, SYPTE said. The free bus connected Sheffield's railway and bus stations with Sheffield Hallam University and the main shopping districts, stopping every few minutes from Monday to Saturday. A similar free bus between Rotherham town centre and Parkgate shopping centre, via St Ann's Leisure Centre, is set to continue for at least the next two years, funded by the owners of the shopping centre.